Coastal dunes are a transitional zone between the marine and the continental processes and are a part of the sand sharing system between the dune, the beach, and the offshore bars. If there is erosion and little sand supply, a dune will not exist. Effective dune management programs are meant to restore, repair, and enhance dunes in coastal communities. Scarping by waves causes stored foredune sand to move offshore and as the beaches in New Jersey erode, the foredunes migrate inland. In order to maintain a dune so that it may evolve and serve its function as part of a greater ecosystem, the dune must be allowed to evolve and move inward as sea-level rises. This aerial photo shows the difference between the dunes of a heavily developed landscape and a natural landscape. The southern part of this beach is part of the Edwin B. Forsythe National Wildlife Refuge. The dunes are allowed to migrate inward naturally, and they are doing so. In the northern part, where every part of the land has been developed, the dunes have no place to move inward. 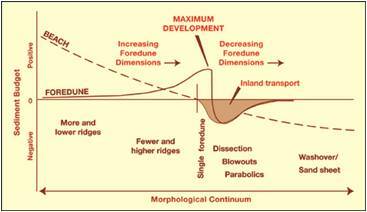 Instead, they are eroded as the shoreline migrates inland unde a negative sediment budget. 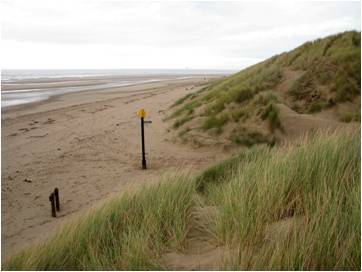 Coastal erosion causes the location of the foredune to migrate inland and impinge on any development inland of the dunes. Beach nourishment mitigates the rate of shoreline erosion and thus the rate of inland migration and loss of the dune system. The community eventually has to decide to artificially replenish the sand, or suffer property loss and damages. 1930 - The New Jersey Board of Commerce and Navigation notes in a report that coastal dunes needed to be protected. 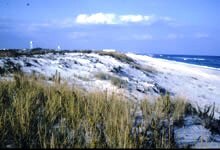 1972 - The Coastal Zone Management Act enables federal funding to promote dune restoration and maintenance. 1984 - A storm destroys many N.J. dunes. A coastal management strategy finally begins to restore these features. Evaluations begin through the New Jersey Department of Environmental Protection to analyze how municipalities manage their coastal dunes. Today - The New Jersey Office of Emergency Management continues to be expanded through the Hazard Mitigation Grant Program to create and restore dunes in coastal communities. 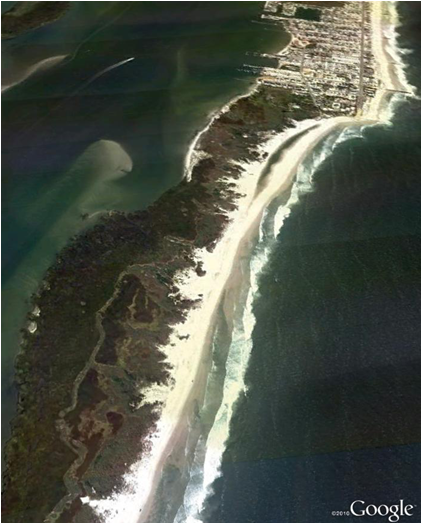 A 40-page booklet is available that provides a basic understanding of the role of coastal dunes in the dynamic sediment exchanges occurring at the shore. It also provides many recommendations for management of this fragile resource. 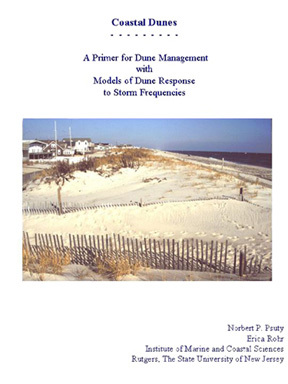 the results of a computer simulation of the interaction of the dune and beach with storms of moderate intensity to illustrate the buffering capability of the dune/beach system. the elements of a model dune protection ordinance for communities to consider for their special cases. Copies of the dune booklet have been sent to each of the coastal communities in New Jersey. Make the check out to Rutgers - The State University, and write "coastal dunes booklet" somewhere on the check. Paul Rooney, a colleague of Dr. Psuty, is a professor at the Liverpool Hope University in the UK. He is a consultant to Golf Environment Organisation, a non-profit dedicated to "helping the global golf community establish leadership in environmental enhancement and corporate responsibility." Golfers and associated stakeholders argue that golf courses on the coast line is less intrusive than heavy urban or sub-urban development. 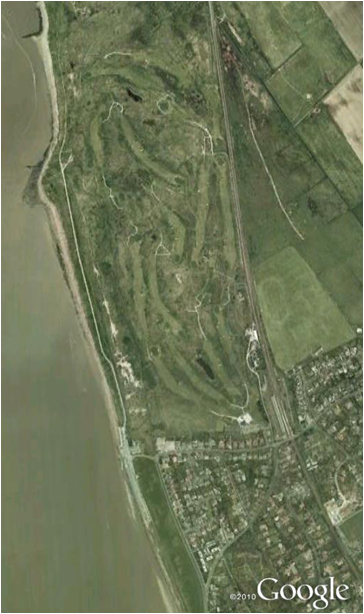 A profile of the dunes near the Links golf course in Sefton.